A day of snow, a car crash, mountain passes and a first for me, dirt track riding. Today was a rather unexpectedly superb day. Yesterday was a good ride but the last two hours were two hours too far, on an arse that was killing me, and to a place I didn't particularly like (Chur). I had a planned route for today which was via long wibbly roads over about ten hours crossing Switzerland right to left, to Le Chable, a place about 15 minutes from Verbier. After yesterday through I decided to shorten it a bit and stay on the main-ish route between the two, avoiding the motorway and dual-carriageways but using the most direct option apart from adding some mountain hairpins at the end to cut a corner. This was probably the best A-road I've ever driven or ridden along! From Chur it quickly becomes a quiet road winding from small town to small town, sticking to the side of one long river valley as you head towards the town of Andermatt, about an hour and a half from Chur. As you get closer to Andermatt though the road starts to climb higher and higher up the valleys, twisting back on itself as it crosses at first low mountain passes and then higher and higher ones in succession. Andermatt itself is stunning and I discovered sits at the head of a valley, the only way out of which is up and over. The image here is taken from the lower end of the pass looking back towards Andermatt and was breathtaking in it's quiet and beauty. Not bad for an A-road route! Eventually you reach the head of the pass and are above the snow line, so cue the almost compulsory shot of the scooter against a nice snow drift. There is a great cafe there with a decked terrace sitting about 20 feet in the air over the side of a snow-filled precipice - a fantastic place to stop, stretch the legs and get a drink and sarnie. This road is known locally as 'James Bond Strasse' and was the location for the long shot in Goldfinger of Bond in his Aston Martin following Goldfinger in his Rolls. This is not the only pass on the route and as you can see in the photo above as the road winds down the hill from one pass, off you then go back up the next one. At the bottom of one of these passes I had parked up to let the hotel know what time I was due to be there (it is a small place so I thought helpful for them to know so they are not waiting around all day just for me to rock up). As I sat on the scooter there was an almighty crunch from about 200 yards behind me and it seemed a small car had misjudged the corner a little, overshot the exit of the corner and slammed sideways into the metal Armco barrier. Oops! Thankfully there were no injuries apart from pride and paintwork. From here there was a view of the distant Matterhorn - a sight guaranteed to make you want a Toblerone immediately! 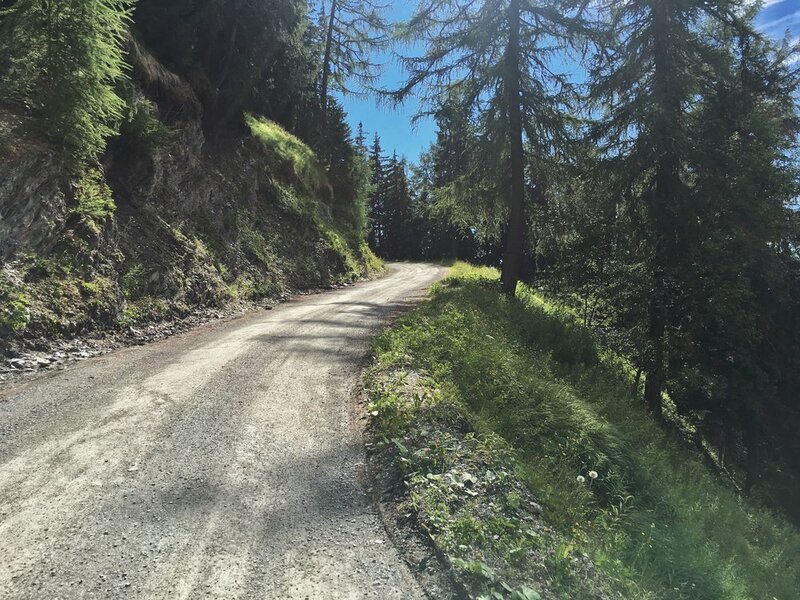 Once I was about an hour from Verbier I had a choice, a long way around on the main roads, or up a mountain pass on an endless series of switch-backs and hairpin roads. As it was my last day in the mountains there could only be one choice so the hairpin route it was. I'm not saying that this was not necessarily the biggest road in Switzerland to start off with, or that the lack of traffic coming the other way crossed my mind as something to take notice of, but when the tarmac surface ran out these things did suddenly come back into focus! By this point I was a good half an hour up the mountain and thought sod it, no point in turning back now so just ploughed on along the gravel and then dirt track, over the crest of the ridge and back down the other side when it met civilisation and a hard road surface again. I still don't know if this was a proper route but what the hell, it worked. The hotel was in a small town called Le Chable, close to Verbier so I popped into Verbier for a nosey around as well. And a thoroughly lovely and agreeable place it is too, although a selection of cold meats, two alcohol-free beers (got to ride back to the hotel yet!) and a cheesecake is about a million Swiss Chuffs so you leave with a satiated appetite but bankrupt. And a last picture from the day, and probably my favourite photo of the whole trip, this cow peering into the camera as I was taking a photo on one of the mountain passes withe the road running along it. Love this photo! A loooooong day today, and in the end turned out to be around a ten hour journey with a good nine hours of riding time in there. That brings the total to nudging on 2000 miles in the last five days and it is fair to say that despite the Burgman's comfy seat and my smug comments in previous posts about bikers, the only feeling in my bum cheeks now is unmitigated pain! From Riva, a last view of the lake, then the first destination was the border town of Tirano which is mostly in Italy but then the Main Street pokes up into the hills and a few hundred meters along it is the border into Switzerland. As last time, the entire EU/Non-EU border crossing is a real time-consuming nightmare, involving slowing down a bit so a bored border guard just waves you on, and that's it. Not exactly the bureaucratic hell that the anti-Brexit campaigners keep promising will be unleashed upon us. After Tiorano the road climbs and climbs until you reach the pass in this photo of the Burgman. Lovely fresh cold air and a quiet road, perfect. From the pass in these photos (and the one below with the glacier in the background of the Burgman) it was then down to St Moritz which is pretty enough but rather 'meh' and is presumably much better in the snow, and then on into more mountains. By mid-afternoon, to be honest I really was not in the mood for more hours of bum-pain, especially when it culminated in the town of Chur, which I can only describe as being the closest thing to an Alpine Salford I can think of. I'm sure it has a pretty centre, but that is a small kernel surrounded by industrial grimness. And the hotel turning out to be some kind of serial-killer motel thing on a main road which didn't help my sunny disposition either.